If you are dealing a lot in document writing and editing, you may have bad experience of trying to find and replace a wrong word with the right one for all the existing documents. Instead of opening every document and search it one by one (for instance: use edit -> search and replace in Microsoft Document), this tiny yet powerful tool will be able to help you to detect and correct all of them in bulk with only few clicks. Known as File Content Replacer, it is a free software utility that can help offload your non-value added task with simple setup. The software utility is very simple to be used. Users don’t even need to install it and just execute the .exe file and you are ready to go. First, just add whatever files that need to be scanned through into the lists. 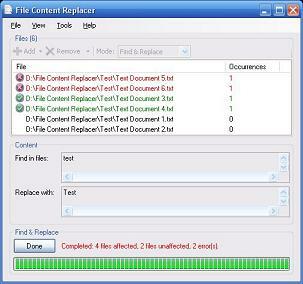 After that, users can select which mode they intend to do, either ‘Find Text’ only or ‘Find and Replace’. Once after completion, enter the keyword for searching and the new text that you intend to replace with (if you choose ‘Find and Replace’ mode). Click on Find button and it will help you to list down and replace whatever is needed in seconds. In case there is a need to view in details how many detection and where is it resided in specific file, users can configure it under the tools -> options by choosing ‘Show Items Details’ to view all the number of occurrences, which line numbers and specifically where the text was found in the selected files. Users can download it at File Content Replacer and hopefully this free software utility will able to eliminate all the hassles that you need to go through manually.